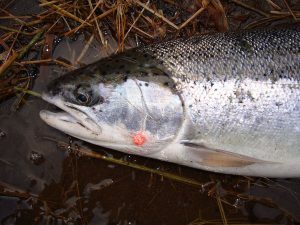 Fishing for steelhead with a bead is arguably the fastest growing and most versatile fishing technique for catching steelhead. Like all great steelhead fishing techniques, it has been a well-guarded secret for many years. No one seems to know for certain when, how, or where fishing with beads began, but there is overwhelming evidence that suggests it started in Alaska fly fishing for trout in rivers full of spawning salmon. Increased popularity in bead fishing for steelhead has coincided with changes in the way anglers learn through sharing knowledge and techniques on magazine articles, Internet blogs, forums, and social media. There is no doubt that a fish egg is one of the most important and memorable foods available in a steelhead’s diet. Entire life histories of steelhead are influenced by the presence of eggs from spawning fish; therefore it shouldn’t come as a surprise that using a lure resembling a fish egg is one of the best methods to catch a steelhead. The beauty of fishing with a bead is its’ simplicity — all you need is a bead, weight, and hook. There are many variations in bead fishing techniques including drift fishing, side drifting or fly fishing; however the most effective and most versatile method is float fishing. Fishing with a bead is extremely simple in practice, but technically very complicated. In the interest of simplicity I am going to focus on float fishing with a bead, which is my favorite way to fish beads. Let’s break down the bead fishing technique into eight main parts that work together creating a fishing system: rod and reel, mainline, float, top shot, leader, weight, bead and hook. This method is really a combination of center pin and jig float fishing techniques. Rod preference for steelhead bead fishing is greatly influenced by the size of the river you are fishing and the weight of the float. The traditional method of bead fishing required long leaders, weighted floats, and just enough weight to keep the bead near the bottom. This was derived directly from fly fishing with a bead. This makes spinning or centerpin rods the best choice for bead fishing. When bead fishing was first was adapted for terminal tackle from fly fishing, long leaders were used and were very difficult to cast not to mention that hooking fish below the angler was difficult or near impossible. There has been a progression towards shorter, heavier fluorocarbon leaders and more weight down by the bead and less weight on or near the float. This makes casting much easier and catching fish down river from where you’re casting is now possible. The shorter leader makes bead fishing very similar to fishing jigs. So it makes sense that the ideal steelhead jig floats and rods would be preferred for bead fishing. The best spinning bead rods are 9’8” to 10’6” long with a moderate action and fast power. A smooth, fast retrieve reel with a good drag greatly helps in keeping up with your float and fighting fish. Because of the advent of braided lines the need for super fast action rods is no longer necessary. In fact, the new super braids are very strong for their diameter and have made it possible to cast smaller floats and use less weight, yet still be able to cast great distances. Thus a medium action rod is ideal for landing big fish on light line. Braid is the preferred mainline selection for bead fishing due its thin diameter, low stretch, minimum drag in the current, and its mending capabilities due to the fact that it floats. It gives the angler a direct connection between the rod and the float. The new super braids have amazing breaking strength for their very thin diameter. Even though they are very expensive, the additional cost is worth it. 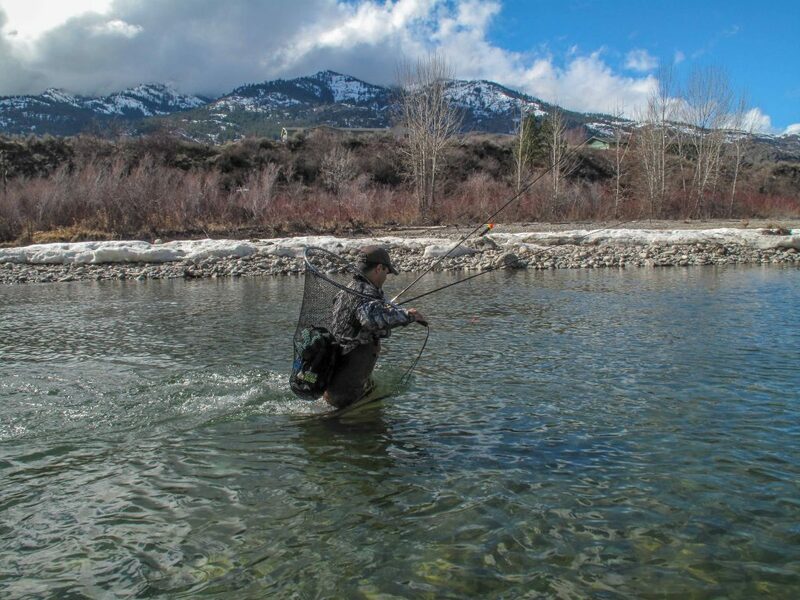 Basic fishing principles dictate that it is very important for the mainline to have a higher breaking strength than the leader, otherwise expensive floats and gear will be lost on a hard fighting steelhead. Just like many other steelhead fishing techniques the float size, weight, and shape has a dramatic effect on the presentation of the bead. The key to being successful at fishing the bead is controlling its speed in the steelhead strike zone at or near the bottom. This can be difficult because the water at the surface is traveling at a higher speed than the water along the river bottom. This is where the centerpin style, sleek and streamline stem style float comes into the picture. Stem style floats are tapered from top to bottom and often have a very thin stem to facilitate control and allow the angler to easily convey what the bead is doing along the bottom. These stem style floats, combined with a top shot of 12- to 15-pound fluorocarbon, facilitate the float moving up and down the top shot for both a fixed and sliding float. Top shotting is adding monofilament line on top of (or in front of) your braided line. The top shot all but eliminates braid float tangles due to its stiff properties. The length of the top shot only needs to be long enough to facilitate the adjustment of the float up or down depending on the depth fished and presentation desired. Plan on running between 7 and 12 feet (shorter for fixed floats). Using weighted floats and/or adding weight on or near the float greatly enhances the casting ability of the angler and helps balance the float for its given weight rating. Fixed floats are better for fishing water less than six feet deep and sliding floats are more desirable in deeper water. Keep in mind, by using a weighted bead and increasing your leader length will increase the depth that you can effectively fish. Another advantage of fixed floats is that the float can be held back in the current to fish water shallower than the float is set at the same time control of the speed and depth of the bead. Just like the top shot, there are great advantages to using Maxima Fluorocarbon for a leader and it is essential because it is very strong for its diameter and line stiffness yet also aides in presentation by keeping the leader straight, and is virtually invisible to the fish. The leader length depends on the depth of the water, the amount of weight being fished and the buoyancy of the bead being fished. The longer the leader, the more natural the presentation. The optimum amount of weight to use varies. It’s best to start off light and add more weight as needed. As with most fishing techniques, there always seems to be the distraction of mimicking nature. Bead fishing is no different; anglers are always looking for a better mousetrap and trying to match the hatch. When I first started bead fishing I was very focused on the bead color and size. This lead to hundreds of bottles of nail polish and literally thousands of different types of beads purchased over the years. After years of trial and error, keeping it basic is the best rule of thumb and best fishing strategy when it comes to bead size and color selection. The idea is that the bead size or “lure profile” is determined by the brightness of the bead (the brighter the bead equals a larger profile and the duller the bead equals a smaller profile, even if the bead size stays the same), the water clarity, the substrate color and amount of structure on the bottom, water temperature, and the brightness of the sky. The lower the water clarity or darker the sky, the larger and or brighter the bead you should use. And vice versa. Also, the colder the water, the bigger and brighter the bead can be versus warmer temperatures when the fish become more finicky and their eyes may physiologically work better enabling them to determine the bead is a fake and not a real egg. There are also the beads that don’t look like real fish eggs at all, they sometimes work really well and who knows why but they just do! It’s best to keep in mind that the steelhead’s brain is more than likely smaller than the bead your are using so don’t overthink it. The most controversial part about bead fishing is the fact that the bead is best fished away from the hook either pegged or by a knot stopper attached to the leader keeping it from sliding down to the hook. You can still catch fish if the bead is on or near the hook, but if it is one to three inches from the hook it results in way more hook ups. The hook with a straight eye or slightly upturned eye snelled is most desirable. The hook size is directly related to the size of the bead; the larger the bead the bigger the hook. Fishing the largest hook possible while minimizing the influence it has on the bead drift is desirable. The biggest variable in steelhead fishing is the water and weather conditions and how it relates to their specific life histories. Beads are so effective for steelhead they allow the angler to quickly adapt ever changing environmental conditions. Beads are the ultimate bobber dogging method to cover all the normal steelhead holding water and the in-between water that the angler may normally pass up and not normally fish. I haven’t found a particular water type or bottom structure that is better than others for bead fishing for steelhead. The keys are adapting the bead presentation to the specific water depth, speed, and water turbidity relative to the sky conditions and then contrast the bead color against the substrate and river bottom color. For instance, a larger, lighter-colored bead will work better with a darker bottom or substrate color and vice versa. Larger, brighter beads will work better with a slower presentation when the water has lower clarity so the steelhead has a better chance to see the bead. 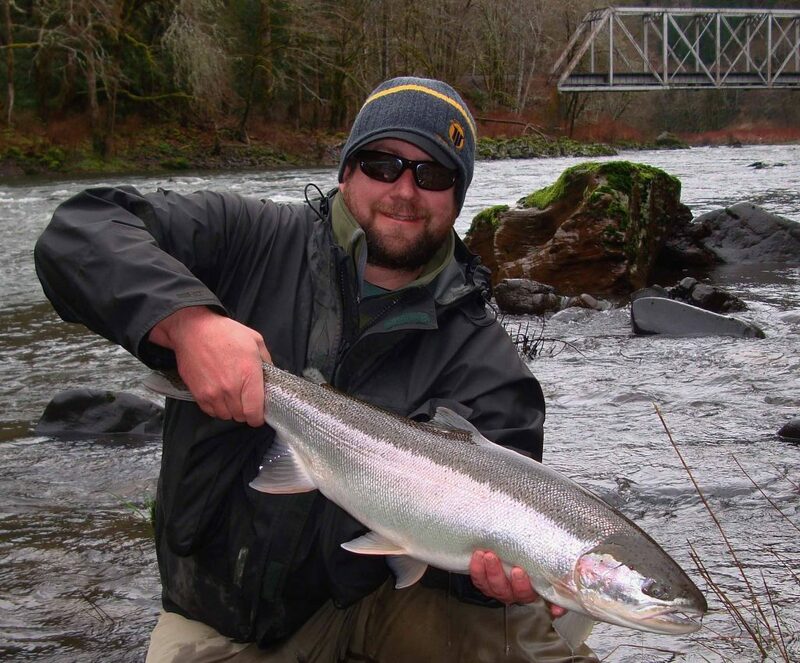 Water temperature affects how well the steelhead’s eye work. So when the water is off color and cold it may be advantageous to add more weight, shorten the distance between the float and weight, and use a bead color and size that has been proven to be more effective. Sometimes it is better to have a relatively drag free drift while other times it better to let the weight drag the bottom and the float drag the bead downstream. When the angler is fishing from a moving boat downstream covering various water types a longer leader with very little weight down by the bead with a sliding weighted float fished upstream from the boats position works best. On the other hand, when the angler is fishing from a fixed position in deep water (greater than six feet deep) a sliding weighted float is advantageous. It’s been proven effective to cast the float and bead as far upstream as possible and guide the float into the suspected steelhead holding water and end the drift when it’s even with the angler or slightly downstream. When fishing from a fixed position in relatively shallow water (less than six feet deep) it would be better to use a relatively shorter distance between the float and the weight with a fixed float and more weight closer to the bead. With this setup it’s advantageous to fish the water slightly above the angler to below the angler until the weight starts dragging bottom aggressively and or hold back the float when the weight starts dragging. Don’t be afraid to extend your drift farther downstream. No matter what float system you are using it is always a good idea to pause and continue to let your float swing until it is straight downstream; similar to a steelhead grabbing a fly on the hang down, a steelhead will often follow the bead and strike a rising bead at the end of the drift. To consistently win at the bead fishing game it is a good idea to be adaptable and use a system that is quick and easy to change for various river and weather conditions. Don’t get caught up on fishing one color or size of bead, floating beads, or neutrally buoyant beads, and try to pattern your success. When you catch steelhead on a bead in one place under certain conditions you can come back again and again and catch fish there and search out similar water.